No, it hasn’t been Writer’s Block. It has just been a denial of the ability to write anything of note in the face of an administration characterized by ignorance, mendacities, and prejudices so appalling that I have felt overwhelmed with despair. I read the op-ed pages in the New York Times (those pundits trump excoriates on a regular basis because they express disbelief at the blatant lies he tells, his refusal to acknowledge errors, and his appalling and pathological narcissism that seems to motivate every move. Enough, no more. It hath made me mad. I would think upon hope. I recall a Peanuts cartoon from long enough ago, and so I’ll probably get it wrong., but I think it was Linus who said I have hope but I have no faith. What this seems to mean to me is that I want the future to improve, but as I look about me I do not see the resources that would effect this positive change. Hope does not exist in the absence of difficult conditions. If all was perfect—in order, say—then the future would be the present. Hope would be unnecessary, a meaningless, empty category. But I hope the future will not be the present, but given the present, I have no faith that my hope will be realized. I am rereading Jonathan Lear’s Radical Hope: Ethics in the Face of Cultural Devastation. I had read the book years ago, but in my purging I had sold to for much less than half-price to Half-Price Books. As usual, as soon as it was sold I needed it and repurchased it. 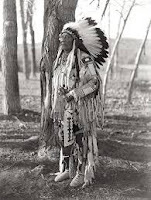 Frank Linderman, a white man and a friend to Plenty Coups and to the Crow, writes that he could not get Crow Chief Plenty Coups to say anything about the Crow after they had been confined to the reservation. Plenty Coups said that “When the buffalo went away the hearts of my people fell to the ground, and they could not lift them up again. After this nothing happened.” Lear explores what Plenty Coups might have meant by this statement. And what Lear suggests is that in the face of the cultural devastation that the Crow experienced, when all the categories disappeared by which they had narrated their lives and given it meaning, nothing happened! In the face of this situation, the possibility of narrative dissolved and after this, nothing happened. But after the buffalo disappeared Plenty Coups led his people because he must have believed not that the past concepts by which the Crow lives could be recovered--confined to the reservation that possibility had become impossible. Nor did Plenty Coups advocate for an empty enactment of past events that now had lost all meaning. Those practices would be exercises in nostalgia. Rather, radical hope existed for Plenty Coups in his belief in a future yet without a knowledge of what concepts might develop with which to write a narrative of the lives of the Crow. Hope, for Plenty Coups, existed in the belief in a future even though Plenty Coups could not conceive of this future because he did not possess any concepts with which he could construct a narrative of/for it. The antifa movement has hope, but as of yet I have little faith.